In a recent project, I was looking to plot data from different variables along the same time axis. The difficulty was, that some of these variables I wanted to have as point plots, while others I wanted as box-plots. Because I work with the tidyverse, I wanted to produce these plots with ggplot2. Faceting was the obvious first step but it took me quite a while to figure out how to best combine facets with point plots (where I have one value per time point) with and box-plots (where I have multiple values per time point). The reason why this isn’t trivial is that box plots require groups or factors on the x-axis, while points can be plotted over a continuous range of x-values. If your alarm bells are ringing right now, you are absolutely right: before you try to combine plots with different x-axis properties, you should think long and hard whether this is an accurate representation of the data and if its a good idea to do so! Here, I had multiple values per time point for one variable and I wanted to make the median + variation explicitly clear, while also showing the continuous changes of other variables over the same range of time. Here, variable 1 (var1) has three measurements per time point, while variable 2 (var2) has one. 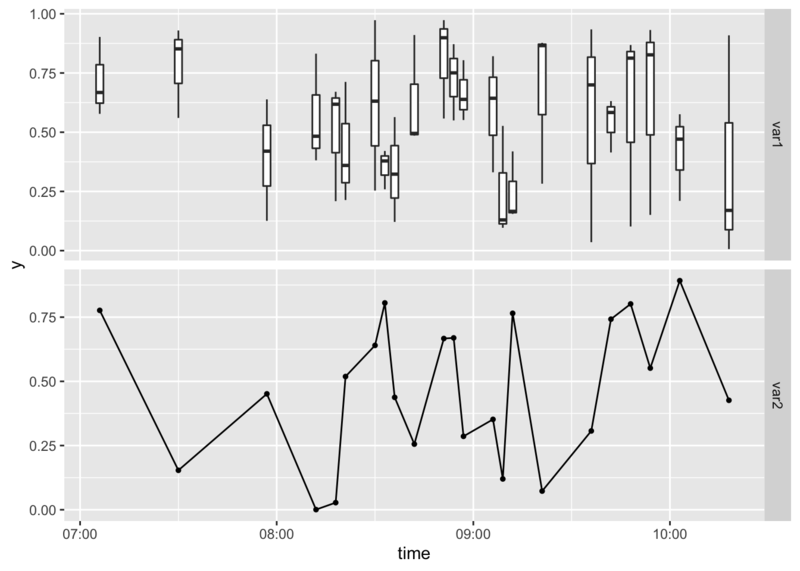 First, for plotting with ggplot2 we want our data in a tidy long format. I also add another column for faceting that groups the variables from var1 together. subset data to facets for box plots and give aesthetics in geom_boxplot(). Here we also need to set the group aesthetic; if we don’t specifically give that, we will get a plot with one big box, instead of a box for every time point.